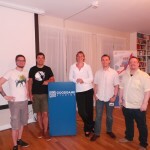 Yesterday evening we welcomed the PHP user group to our offices for the first time. This was a chance for us to make sure we were up to date with the latest PHP technology, and to share our own knowledge with our guests. The PHP user group event takes place once a month at a different location each time, and this evening there were around 70 participants. Before the presentations began, there was a chance for anyone who was interested to look around our premises, and several curious guests took the opportunity. The evening’s program began with a brief opening speech from our Chief Technical Officer Stefan Klemm. 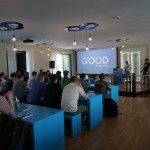 Then two of our PHP developers, Dennis and Christian, gave a talk on “The Goodgame Shop – how to achieve high scalability and low response times worldwide”. The Goodgame Shop processes all the payment transactions from our games. Dennis and Christian discussed how the shop has been developed so far, and what its future prospects look like. With an increasing global market share, our technological structures must be constantly adapted to new situations. One aspect of these technologies focuses on increasing the performance of websites. How this performance is measured was discussed in another talk by our colleague Lars at the Web Performance Meetup, which also took place recently at Goodgame Studios. The second topic of the night was “The path to good project methods”. Judith Andresen, a technical consultant, discussed steps to take, and gave some tips to optimize processes. After the official part of the evening was over, there was time for networking over snacks and drinks. The event went down very well with all those present, and there is nothing to stop another PHP user group meetup at Goodgame in the future.